Comments: The simpler complex stitch is based on alternating dc and sc on the same row; this can be do in several ways; I like this one, because the result is very geometrical ordered (yes, I am a scientist and I like cleanness!) and it resembles chicken footprints (hence the name) . A good pattern for baby afghans and for warm shawls. 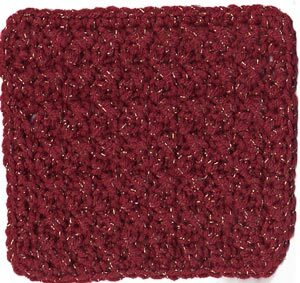 Material : Worsted Weight Yarn, Hook no.4.5 (US=G/7);you may want to give a look to my virtual store if you need materials. Make uniformly distributed scs on vertical sides, sc in ea sc in top side, sc in ea starting chain in bottom side. Join with sl st to first sc. Cut thread, weave in ends.